HELSINKI (Reuters) - Finland's populist opposition leader could join a new government after April's general election with his calls to end bailouts and kick Greece out of the euro likely to ensure Helsinki sticks to its tough line on EU affairs. The Finns party, formerly known as True Finns, rose from obscurity to come third in the 2011 vote, spooking markets but winning over voters with criticism of EU financial rescues for fellow members of the euro during the debt crisis. Finland has taken one of the hardest lines in negotiations with Greece but party leader Timo Soini refused to join the pro-bailout government coalition, a move many saw as a mistake as it threw the party into ineffective opposition for four years. He now wants to leave the political wilderness. While still opposed to the aid packages he calls "pyramid schemes", Soini has toned down his rhetoric in other areas - perhaps realizing it is now or never for the 52-year-old who started in politics as a teenager and has steered the party for 17 years. "It is important that the party moves to a next stage. That is what our members and supporters want, the power is in the government," Soini told Reuters. Polls point to an election win for opposition Centre party leader Juha Sipila, with around 25 percent. But Soini is battling for second place with the ruling center-right National Coalition and the Social Democrats, each with 14-17 percent. He may benefit from the unpopularity of Prime minister Alexander Stubb and his quarrelsome coalition. Finland has been in recession for three years, its flagship Nokia company has shed thousands of jobs and it has lost competitiveness to other EU economies. Economic stagnation may make bailouts even more unpopular in Finland just as EU chief executive Jean-Claude Juncker called for European governments to show solidarity with Greece. The current government in Finland angered other European countries by demanding collateral before agreeing to help Greece and Spain and maintained a tough line in negotiations on an extension to Greece's financial rescue agreed last month. Soini said Finland should not be involved in any more aid packages and Greece should leave the euro zone. "We need a Grexit," he said. "There are no easy solutions, but if Greece continues in the euro, it means more aid packages and the pyramid scheme continues." "The way I see it, the minimum is that if this (bailout) policy continues, Finland stays out of it," Soini said. "The euro zone, as it is now, does not work. Let's start by Greece and perhaps Cyprus leaving the euro, then we could take a look and draw conclusions for Finland," he added. In Finland, no political party has much power on its own, so Soini would probably end up in a compromise in the next coalition, which will likely include 3-5 parties. "Having The Finns in the government would probably mean that national interests would be emphasized (in EU), and Finland would continue its tough line towards aid packages," said Tapio Raunio, professor of politics at University of Tampere. A fan of London football club Millwall, Soini is a charismatic speaker who has won over voters with his man-on-the-street image. But he has often struggled with controlling grassroots members, including one lawmaker who photographed a friend giving a Nazi salute in parliament, and was expelled from the party. But he has distanced The Finns from EU far-right parties and last year changed his party's EU group from EFD, which includes Britain's UKIP, to ECR, home to the Britain's Conservatives. He has also toned down rhetoric on topics such as immigration, even though his party is still seeking tougher restrictions. 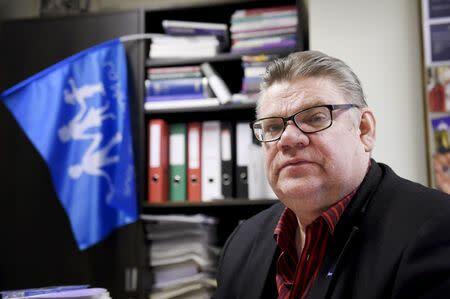 Soini, a former EU lawmaker and current chairman of the Finnish parliament's foreign policy committee, has also highlighted his international experience. "It's now or never for Soini. He has led the party for almost 18 years, there is some criticism towards him inside the party, so this is his chance to win a prominent minister post," said senior researcher Mari K Niemi from University of Turku.